The Canadian Mountain Running Association mourns the loss of one its strongest supporters, Jim Clampett. According to the Calgary Roadrunners Club, Jim passed away yesterday, February 27. He was 80-years old. He was a long-time and consistent supporter of mountain running and was integral in the foundation of the mountain running association in Canada. He was himself an accomplished runner and generously contributed his time and energy to the sport. He will be sorely missed. The CMRA extends its sympathies to Jim's family and friends. 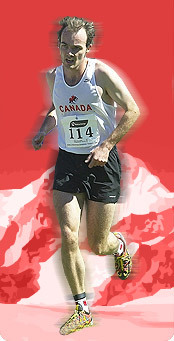 Each year, the Canadian Mountain Running Men's Champion ‎is awarded the Jim Clampett Award. That tradition will continue in his honour. The Canadian Mountain Running Association sends teams to several international events throughout the year, each with their own selection criteria. (b) members of the Canadian Mountain Running Association. (c) members of their provincial branch of Athletics Canada (e.g. BC Athletics, Athletics Alberta, Athletics Ontario, F�d�ration Qu�b�coise d'Athl�tisme, etc.). Membership with the CMRA comes with additional benefits, such as discounts at races across the country!